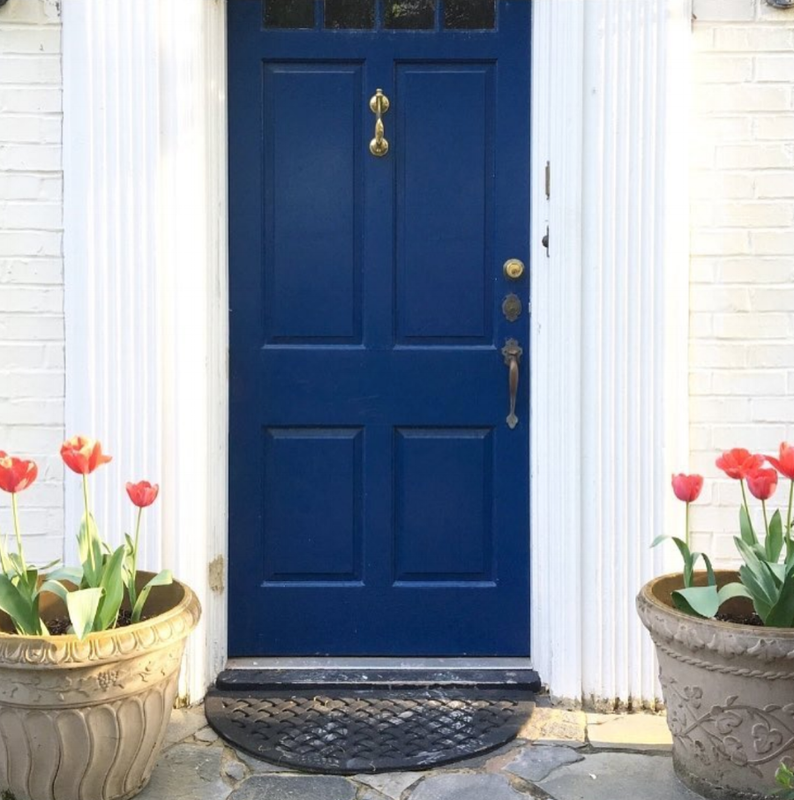 Part of what we loved about our house was the charm of it's exterior when we were house hunting - white brick and a bold blue door. White and blue are a classic pairing and a perfect fit for our 1928 classic home. With the front door being one of the first impressions, we wanted to refresh the look and patch up the wear and tear from over the years. As you may have guessed, we are sticking with blue for our door color. I shared the other week how we picked the perfect paints for the inside of the house, but the exterior is a whole new ball game. We painted the first five on the door starting with white primer underneath the colors to make sure the previous door's color wasn't altering the hues. Out of the below, we were leaning on America's Cup Navy and Inked. Next, we added Gentleman's Gray, Commodore Blue and Symphony Blue to the mix making sure to look at them in different light. Here are the colors up close on the left and inside with the door swung into the house on the right. So different. America's Cup Navy was a little too gray and actually looked green in the inside light ruling it out. Looking at the colors from the street, Gentleman's Gray was too dark and Commodore Blue and Symphony Blue were a bit too cobalt. We settled on Inked by Behr for it's deep blue color that still read blue and kept its rich tone from the street, inside the house and up close. Here is a look at the final door. More work to door on the white frame!